As the government's proposed anti-terror bill heads towards the legislative finish line, some of its more conservative-minded critics are warning Prime Minister Stephen Harper that its passage could carry a heavy cost for his party when they hit the campaign trail later this year. As the government's proposed anti-terror bill heads towards the legislative finish line, some of its more conservative-minded critics are warning Prime Minister Stephen Harper and his caucus that its passage could carry a heavy cost for his party when it hits the campaign trail later this year. Libertarian-leaning voters who have backed the Conservatives in the past may choose to throw their support behind the Libertarian Party of Canada or independent, small-c conservative candidates, it says. The letter has been signed by more than 60 supporters — who describe themselves as from the "conservative and libertarian side of the political spectrum" — including National Firearms Association president Sheldon Clare, Free Dominion co-founders Connie and Mark Fournier, National Post comment editor Jesse Kline and Libertarian Party Leader Tim Moen. Clare's inclusion on the list is particularly noteworthy, given his apparent reluctance to publicly criticize the bill in the past. Now, however, he seems to have come around to the collective view espoused in today's letter: namely, that C-51 "represents everything that principled conservatives have been fighting against for the past decade." Enhanced information-sharing powers that will allow the government to "create databases on all Canadians with no oversight," which, the letter says, will lead to "a long-gun registry on steroids." New provisions against the promotion of terrorism that could lead to "secret trials" and the censorship of free speech — both of which go against principles that "resonate strongly with voters on the right." Allowing CSIS agents to employ "vague, and even unconstitutional 'disruption' measures" in applying the new rules, which could lead to the targeting of Canadian website operators. "The problems in C-51 could have been fixed, if you had chosen to carefully listen to the advice of experts who honestly see the legislation as ill-conceived, setting dangerous precedents, and opening up doors to severe violations of Charter rights and privacy expectations of citizens in a free society," the letter says. The letter ends by posing a pointed question to the recipients: "Do you really want to live in a C-51 Canada that you don't govern?" "We don't either. 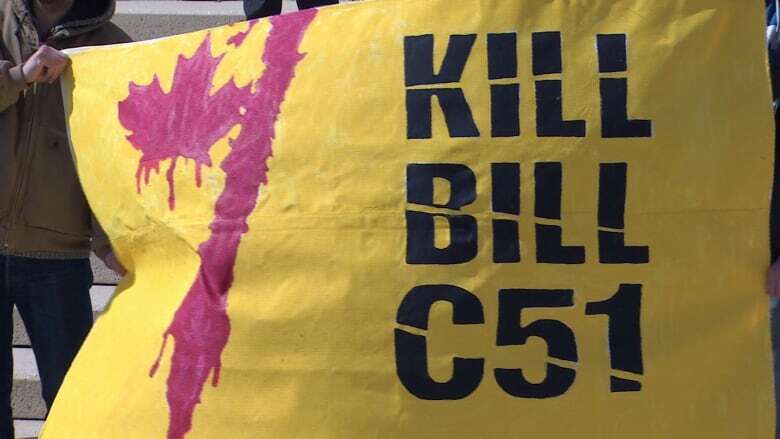 Kill Bill C-51." Protests against the legislation were held in several Canadian cities again last Saturday, the third time simultaneous rallies were organized by groups concerned about the bill's provisions. In video of the Toronto rally shot by citizen journalist Derek Soberal, lawyer Rocco Galati called it a "fascist and dictatorial piece of legislation" and announced that if it passes, he'll mount a court challenge to overturn provisions he says threaten Canadians' constitutional rights to free speech and assembly. Galati has challenged several of the Harper government's actions, most notably winning a case which found Marc Nadon ineligible to sit on the Supreme Court. He's also mounting a challenge to recent changes to the Citizenship Act. The Canadian Bar Association is also among the critics warning legislators about the bill's provisions. An earlier version of this story referred to the editor of the National Post comment section as Jason Kline. In fact, his name is Jesse.